Look sideways at yourself in a mirror, if your ear is not in line with your shoulder and your hip, then as this article discusses, this can be a sign of forward head posture (FHP). FHP can be a cause of depression, low mood, hormonal imbalance, foggy thinking, irritability, digestive problems, low confidence, low energy, sleep problems, balance disorders (as well as the more commonly associated back pain, headaches, herniated discs, migraines, dowager’s humps, kyphosis, arthritis and trapped nerves). It can reduce your lung capacity by up to 30%, affecting athletic performance. FHP has been proven to decrease testosterone levels by 20% and increase fat-storing hormone cortisol by 25%. I find that in our typical daily lives (mine is nothing different) we are pulling our heads forward constantly- driving, texting, cooking, washing up- we have a forward leaning culture. What we can do to counter balance this is put our head back on top of our spine now and again. We jut the chin forward plenty, what we don’t do so often is put it back again. Runners, cyclists, footballers, text-ers, computer users, children, teenagers, it’s worth being aware of where we put our heads, as these changes to spinal alignment can become permanent/ irreversible. Take a google at the two greatest footballers in the world (side image) and realise even the fittest aren’t neccessarily immune. 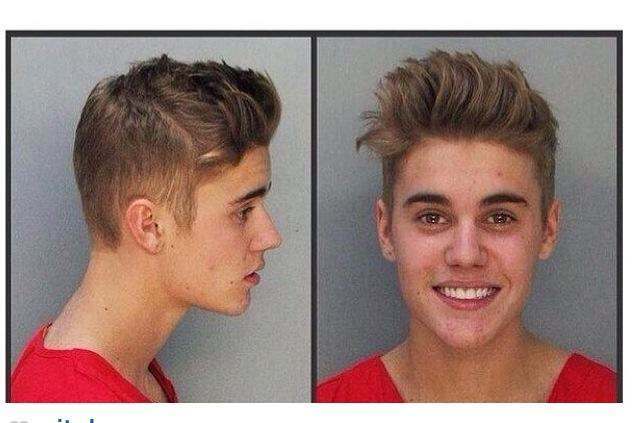 Even Justin Beiber’s side mugshot confirms, this is one degenerative problem the younger generation need to be more concerned about than the older. 1) Move our heads like chickens. That means jut the chin forward and make sure to retract it all the way back in again (this exercise was also recommended by a doctor to a student who had a herniate disc in the neck, from forward head posture due to prolonged periods of driving to the office). 2) Bring one ear at a time down to the shoulder and hold there for a few breaths to stretch out the side of the neck (or my favourite muscle, the SCM). 3) Hold our phones in front of our faces, about 12-14 inches away, rather than moving the head forwards and down to look at a screen. On average, people read printed page 16 inches away. But studying dozens of people, Dr. Rosenfield found that even though the font size was the same in both printed page and electronic page, the electronic page was read closer in. “It’s somewhere between 12 and 14 inches on average, and some people as close as 7 inches,” he said. 4) Raise a laptop up (and never put it on your lap) and if possible, sit on the floor (rather than a chair- topic for another day). The whole spine is related. Pull the head forward then the upper back will pull backwards and hips forwards, so a sore neck/ upper spine can relate to lower spine issues. 5) Look up, a lot- tilt the head backwards- do an occasional backward backbend- like a waking up stretch or a standing cobra- reach your arms up and behind your back- anything that extends the spine backwards rather than flexing it forward- for a change. Any thoughts/ comments please post them below I hope this is helpful and thanks for reading!